Handmade blankets are useful for coordinators to give to many organisations and make a lovely gift for babies, children and teenagers ‘in need of a hug’. Check with your local coordinator whether they distribute blankets and, if so, for the sizes they find most useful. Don’t forget that we need as many made in colours suitable for boys as we do for girls! Many of the patterns can be adapted to use for any size of blanket. You may use our patterns – or make us one using your own favourite pattern. We love variety! Use soft DK baby yarn in white or pastel colours. Please ensure there are no holes, hard ridges or anything to catch tiny fingers and that all ends are sewn in securely. 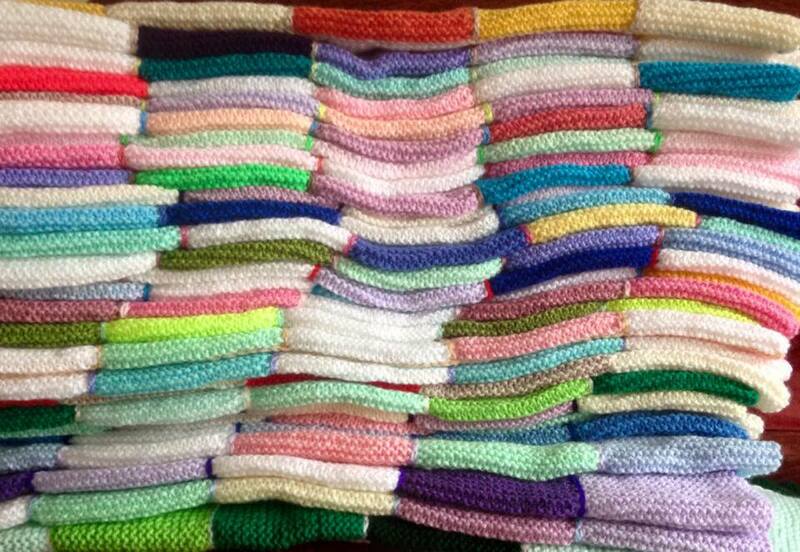 Blankets made in one piece are ideally suited for giving to premature babies. Children up to around 5 years of age get comfort from having a blanket to cuddle. These blankets can be made in lovely bright colours or even use the colours of your local football teams! Large blankets are great for teenagers and again bright colours go down well. Man made yarns are the most suitable as there is less risk of a child being allergic to these. Aran weight yarn can be used for a larger, thicker blanket. It is impossible to give an accurate quantity of yarn required as the yardage varies between brands. However, lots of the patterns look good made using remnants of yarn in a variety of colours. Charity shops often have yarn they cannot sell – the balls may have missing labels or be part used. They usually send it to the textile skip so it’s worth asking. Browse through a small selection of knitted blanket patterns below. For a much larger selection of patterns please visit our Pinterest pages where you can find hundreds of patterns and tutorials organised by theme. Please note that blankets should have no embellishments such as ribbons, buttons or beads because of possible choking, or little fingers being damaged.